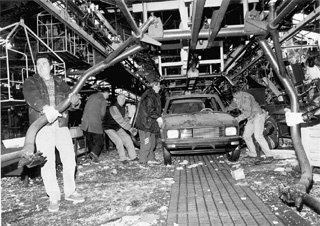 RESOLVE: To donate 1,000 pesos to the workers of the Zastava factory, destroyed by the NATO bombs when it was occupied by the workers themselves, at a cost of tens of lives, and to the workers of Yugoslavia. We are sending this donation and our combative greetings through the 'Sottoscrizione per gli operai di Zastava' initiated by the SLAI Cobas of Alfa Romeo." The Mexican students would greatly appreciate it if you could convey their greetings to the Yugoslav workers coura geously facing NATO's bombs. We encourage working people and opponents of imperial ism to join in this initiative and to mobilize the power of the proletariat to defeat the imperialist war through class war.